Spoon’s mother reassures him by pointing out all the wonderful things that spoons do, that the other utensils miss out on – “Your friends will never know the joy of diving headfirst into a bowl of icecream” she says, or clinking against the side of the cereal bowl or relaxing in a hot cup of tea. 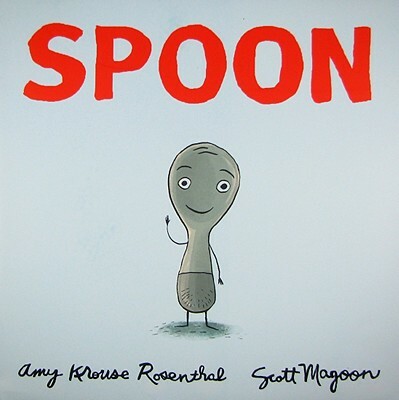 The story ends with Spoon hopping into bed with his mum and dad where they sleep the only way spoons can – spooning. We’ve looked at books in the past about acceptance and fitting in, including One and Different Like Coco, but Rosenthal tackles the subject with her special brand of humour which appeals to children and adults alike. 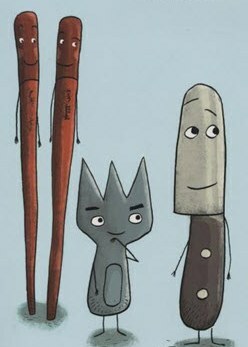 Add to this Magoon’s charming illustrations – who knew utensils could look so expressive?! There are lots of clever and funny details to look out for including the ‘black-sheep’ of the utensil drawer, the Splayd. Spoon is available from The Book Depository for $17.37 with free shipping!